The scene has changed over the past few years that everywhere you see ready-made packs of murukku maavu(fried snack made with rice flour) packets readily available-at all super markets and general stores specially during the festive seasons where we never have to strain to make one! just have to mix and fry,that too not one variety many variations are available and even ready to eat fried packs of murukku are always spread out all through the year in our favorite branded sweet and snack shops.But murukku we make at home is always special and that taste is always one of its kind and store-bought never will equalize the home-made one,not only for murukku it applies for all the other items. This is the traditional murukku variety that my mom and my grandma makes not to mention even my mother in law makes the same. Its taste is so special because its made out of rice batter and grinding the murukku batter to thick paste is more important I mean the consistency should be correct.Don’t add too much butter than the required amount otherwise the batter will disintegrate in the oil itself and more importantly we should start to fry as soon as we mix the batter otherwise it will consume oil and murukku will start to brown.You can use any grinder that you have at home and I made it in a wet grinder and if you are making it in a mixie then put small portions and grind smoothly otherwise its hard to get smooth batter from a mixie. 1.Soak rice with red chillies for two hours and grind smoothly in a wet grinder. 2.Be careful when adding water sprinkle little by little and grind. 3.In between sieve roasted fried gram powder,keep ready with all the ingredients listed. 4.Butter should be soft not hard. 6.Keep ready with murukku squeezer greased a little. 7. Add fried gram powder,asafoetida,salt,butter and jeera to the batter and mix well to form a soft dough. 8.When mixing itself keep a kadai with oil. 10.When the oil is fully hot squeeze it in a ladle then transfer to oil and when frying itself bring heat to medium. 11.When all the sizzling sound gets over take out in a tissue,proceed the same process for all the batter and store it in an air tight container. Soak rice with red chillies for two hours and grind smoothly in a wet grinder. Be careful when adding water sprinkle little by little and grind. In-between sieve roasted fried gram powder,keep ready with all the ingredients listed. Butter should be soft not hard. Keep ready with murukku squeezer greased a little. Add fried gram powder,asafoetida,salt,butter and jeera to the batter and mix well to form a soft dough. When mixing itself keep a kadai with oil. When the oil is fully hot squeeze it in a ladle then transfer to oil and when frying itself bring heat to medium. When all the sizzling sound gets over take out in a tissue,proceed the same process for all the batter and store it in an air tight container. When squeezing out into the oil the heat should be high(hot enough)then reduce the flame(medium high not too low) for even crisp cooking. If you cook it in high heat for all the time then the murukku will not be crisp. Batter consistency should be correct otherwise whole thing will be spoiled. If you don't want to add chillies you can skip adding it. I felt that wet grinder is the best than using a mixie and taste also differs. I have used star shaped nozzle you can use any type even a round one. 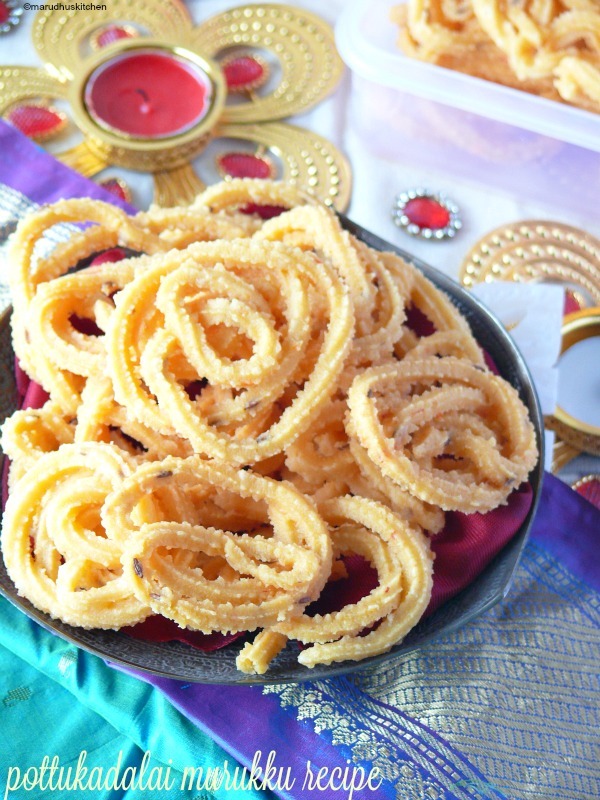 Murukku is my all time fav snack, it looks so crispy and crunchy..yum !! Murukku looks nice and crisp. I love all kinds of murukku.. It looks crispy and yummy.. Love it..
Looks so crispy and tasty!